Over the past five-weeks local director Maria Juranic has been dropping knowledge on emerging teen video makers in the Music Video Workshop in Teen Programs. We met twice a week, starting off with introductions in true WACTAC fashion where the group questioned each person for two minutes. If you were there it went something like this Q: “Would you rather be blind or deaf?” A: “Blind” Q: “If you were a super hero, what super power would you posses?” A: “The power to bend things with my mind.” Q: “Who’s your favorite Muppet Baby?” A: “Animal.” Q: “If you could have any job what would it be?”A: “The President’s Wife.” Q: “Who’s the coolest person you know?” A:(Get ready for the aww factor) “My mom.” and a nother question I never quite understood Q: “Would you rather live under a rock or a log?” A: “What?” After priceless moments like these we got down to business. Maria, using her own work as an example including videos for local artists such as P.O.S, Cecil Otter and Eyedea & Abilities (see here), broke down the process of conception to completion. She showed us how to make treatments, storyboards, and shot lists. During the first week we warmed-up by making short videos set to Doomtree’s “Wait a Minute”, where editing took place in camera and groups worked togehter to interpret the music visually. 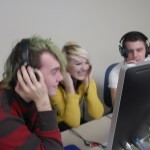 Out of a pool of music submissions from local high-school students, the video makers chose four bands/artists who they wanted to collaborate with, and were given three weeks to conceive of an idea, meet them, shoot the video and edit it. In order to draw inspiration from other sources aside from popular media we toured the Dan Graham exhibition where we saw methods of using a camera as a mapping tool to explore relationships between space, others, and oneself, as well as viewing his music-based video work. I spoke with Daniel Smith the Assistant Archivist about what other Walker films we could show the students. He pointed out a few artists who used music as an integral part to their film pieces and Maria, Witt, and I agreed on Kenneth Anger’s Scorpio Rising and Kustom Kar Kommandos, Bruce Conner’s Mongoloid, Charles Atlas’s Hail the New Puritan, and William Klein’s Broadway by Light. While some students chose to comment on content others commented on formal aspects like the use of color and contrast between leather-clad masculine figures and the choice of light-hearted music. 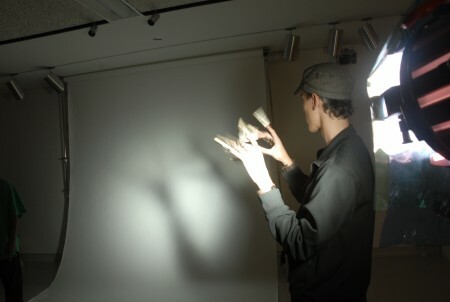 Conner’s work generated a discussion about found footage and constructing narrative, while Klein’s piece offered suggestions about timing music to repetitious visuals. After a busy week of shooting inside and outside of the Walker, freezing in the elements, dead batteries, lost footage, late bands and plenty of fruit roll-ups, Rice Krispies, and Cheez-its, we are now in the final stages of production. Through a partnership with The Blake School, the students have been using the Blake Media Lab to edit their videos where they are hard at work putting the pieces of the process together. Come by and view the fruits of their labor Wednesday, December 16th in the Lecture Room at 6pm with mmmmm, you said it, pizza to follow after!